TEFL and TESOL are all courses taken to provide the required certification that approves one as a qualified English teacher. They provide great professional opportunities across the world to the fluent and native English speakers who get the certifications. TEFL refers to teaching English as a foreign language while TESOL in full means teachers of English to Speakers of Other Languages. TESOL refers to the certification awarded to qualify one to teach in non-native English speakers in the native English speaking countries. Qualification for teaching opportunities. In most countries the minimum qualifications include a TEFL certificate and a bachelor’s degree. Gain the required teaching skills needed abroad. This course refreshes the learner’s grammar, concepts and so much more. It prepares the individual to teach the language skills and enables proper planning of lessons for the students to be. To stand out in applications. In situations where the TEFL certificate is not a necessity, having one will push you to the top of the list. To ask for a higher salary in better and more reputable institutions. The TEFL course basically includes topics such as classroom management, simplified English grammar, teaching English Language skills, planning lessons, how to build effective learning materials and identifying learning styles. The course can be taken online or in person. The duration can last for two to three weeks up to one year depending on the student’s availability and dedication. If one does not complete the course within a year of application, they may have to re-do the whole course from the beginning. TESOL is an accredited teaching professional qualification that qualifies the holder to teach English to speakers of other languages. The qualification is awarded after successful completion of a set of courses. This certification is listed under the UK Ofqual qualification Register and is externally moderated by authorized and recognized institutions. One can take the course on part-time schedules or full-time and some institutions also offer the ability to take it subsequently with other courses. There are more than 100 qualified and validated institutions where one can take the course. However, there are only five higher education institutions that offer the course University of Manchester, University of Exeter, Keele University, Sheffield University and The American College of Greece. The minimum number of hours required to complete the course is 200; 130 timetabled hours and 70 non-timetabled hours. TEFL stands for ‘Teaching English as a Foreign language’ while TESOL stands for ‘Teaching English to Speakers of a native language. TEFL is basically teaching English to individuals in countries where English is not the first native language. TESOL refers to teaching English to speakers of other languages located in the native English speaking countries. TEFL accreditation is more compatible globally. 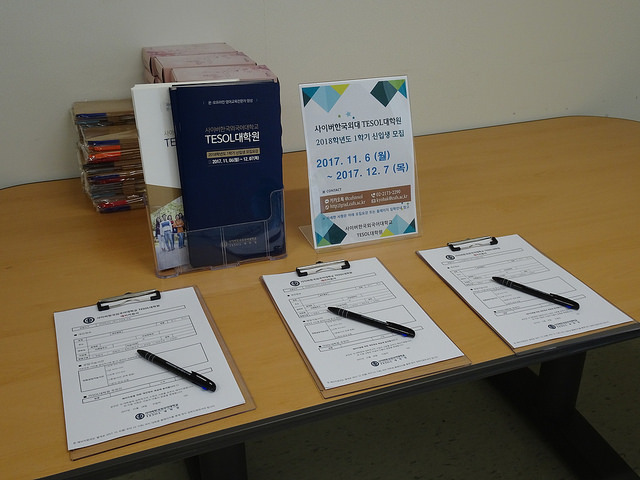 It is a requirement in more job applications compared to TESOL. On the other hand TESOL is not often listed a job requirement. The educators of TEFL are not necessarily supposed to originally be from native English speaking countries. TESOL educators however, must be from native English speaking countries. In order for one to qualify globally as an English teacher the TEFL or TESOL certificate is often a requirement. TEFL stands for Teaching English as a Foreign language while TESOL stands for Teaching English to speakers of a native language. Both the courses take approximately 120 hours to complete, and can be completed within a year. TEFL is more compatible globally than TESOL. TESOL is a requirement in English native speaking countries, however, TEFL is not. The educator requirements for TESOL make it compulsory for them to originate from an English speaking country, however, this does not apply to TEFL. The average course of TEFL/TESOL courses from accredited institutions ranges from $400 – $600 for the online learning programs. The cost for offline learning ranges from $1500 – $2000 inclusive of tuition and other expenses. Evah Kungu. 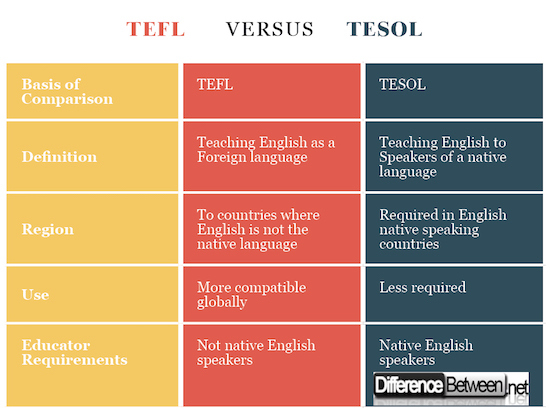 "Difference Between TEFL and TESOL." DifferenceBetween.net. May 17, 2018 < http://www.differencebetween.net/miscellaneous/career-education/difference-between-tefl-and-tesol/ >. Williams, C. H. (2017). Teaching English in East Asia: A Teacher’s Guide to Chinese, Japanese, and Korean Learners. Springer. Collin, S. (2005). The Guide to English Language Teaching Yearbook 2005. Modern English Publishing. Koutsantoni, D. (2007). Developing Academic Literacies: Understanding Disciplinary Communities’ Culture and Rhetoric. Peter Lang.